RYA Volvo Dinghy Show 2011 5th - 6th March 2011. The RYA has announced that Volvo Car UK will be the new title sponsor of the RYA Dinghy Show, the only exhibition in the world dedicated to dinghy sailing. Volvo chose to become title sponsor for the show to compliment their current sponsorship portfolio of British Sailing. "We are delighted to be working with the RYA again and with the show dedicated to dinghy sailors. The RYA Volvo Dinghy Show provides a great platform to expand our brand's appeal, showcase our cars and features which suit the sailing community so well", said Lesley Milne, Head of Events and Sponsorship, Volvo Car UK. The show provides dinghy sailors of all ages and abilities with the latest boats, kit, along with coaching sessions and advice from experts, including Olympic class sailors, all under one roof. Volvo has been involved with the show since 2000 through their support of the RYA's youth training programmes. Jenny Curry, Dinghy Show event organiser said: "We are really excited that Volvo is sponsoring the show for the next three years. We are confident that with their support the show will become bigger and better than ever." The show, which has been running for over 50 years, will now be known as The RYA Volvo Dinghy Show, in association with Yachts and Yachting and Suzuki. The 2010 show takes place at Alexandra Palace, London on Saturday 6th and Sunday 7th March. Further details on, ticket availability and 'what's on' to be announced in the coming weeks. At the end of yet another exciting RYA Volvo Dinghy Show, in association with Yachts & Yachting and Suzuki, early indications show an increase in visitor numbers. Visitors, exhibitors and organisers alike have all expressed how delighted they've been with the weekend, with talks, demonstrations and aisle ways being packed to the rafters throughout. Lesley Milne, from new 2009 title sponsor Volvo Car UK said "This is our first year as title sponsor of the show and we are really pleased with how well it has been attended. The audience is great for us; our new Volvo XC60 is great for sailors and has had so much attention during the show." It wasn't just the sponsors who were delighted with the show; Brenda Hoult, a sailor at Weston Sailing Club who visited the show said: "I'm no rock star but it's the approachability, enthusiasm and personal service you get from the exhibitors, experts and even the star sailors that really make the show what it is." Around the show the mood was much the same for the 250 plus exhibitors. Greg O'Brien from Purple Marine commented: "The show has been very good, we're really happy, there's definitely no credit crunch here." For Neil Pryde it was a similar sentiment. "We've used the show as an effective springboard to launch our new range and the feedback and enthusiasm we've had from the visitors has been very exciting and positive. If interest at the show is any indication, we will have a very prosperous year", commented Chris Lewis. Over on the Laser stand Chris Huffen said: "We've had lots of interest on the stand from visitors wanting to speak to the experts who sail the boats, but also those who want to see the boats and also buy the boats. It's been a really good." Steve Gray, RYA marketing manager said of the show: "We have seen an increase of over 10% on last year's visitor's numbers and we are delighted. The show has really been a huge success and we hope to make the show even bigger and better next year." Whether you're an aspiring dinghy sailor or have years of sailing experience, nothing could be more inspirational then hearing from the crème de la crème of dinghy sailors for those invaluable hints and tips. At this year's RYA Dinghy Sailing Show, in association with Yachts and Yachting and Suzuki, you can do just that, with top dinghy sailing stars including Geoff Holt and sailors from the British Olympic team providing insights in to their sailing experiences. 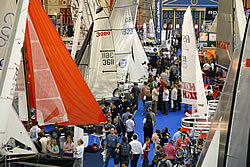 Tickets cost Prices will be available on the RYA Volvo Dinghy Show website www.dinghyshow.org.uk . By buying your tickets in advance you can save money and beat the queues. Also this year, thanks to the shows newest sponsor, Crystal Active, anyone who purchases a ticket before the show will have the chance to win a fantastic family activity holiday to one of Crystal Active's beach clubs in either, Greece, Turkey or Croatia; full details available on the Dinghy Sailing Show website. So book online now at; www.dinghysailingshow.org.uk or call the ticket hotline on 0845 345 0424 .